Exquisite mix of Sterling Silver, cubic zirconia and high-quality cultured freshwater pearl, all crafted into the stylised Dali-shape heart and threaded onto a Sterling Silver chain. Size: 2.2cm (1") (exc bale). That's 3cm (1¼") with bale. 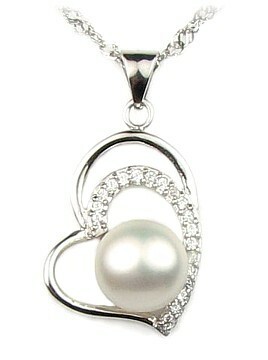 Width 1.6cm (¾") Freshwater Pearl - 9mm.